For God So Loved the World He Gave His One and Only Son. ​Cherish is our Sunday School program at Calvary. It stands for Children Hearing Everlasting Religion at Swede Home. Cherish meets Sunday mornings at 9:15 during the school year. It is open to youth preschool age and up. Middle School and High School students are welcome and often have the opportunity to help lead. During the school year, the adult and CHERISH Sunday Schools come together for an Inter-generational Sunday School. This is a new program introduced in the 2018-2019 school year but both youth and adults look forward to it as we bring together the wisdom of the elder and the wonder of a child. Every year the CHERISH youth share their gifts with the congregation in the Christmas Program. 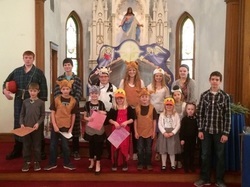 Confirmation at Calvary is a two year program typically for middle school students. It meets on Wednesday nights at 6pm. We are currently meeting with the confirmation class from Zion Lutheran Church in Benedict so classes are held at Salem Lutheran in Stromsburg. Confirmation students study the Bible, Lutheran history, and Luther's Small Catechism. An adult they pick serves as a mentor to them and together they complete a project. Other projects are assigned as well that youth are encouraged to complete at home with their parents. In January, the students attend the Nebraska Synod Middle School Gathering. Youth are encouraged to spend a week during the summer at camp Carol Joy Holling. Our youth are fortunate enough to have two opportunities to attended each year. Both vacation Bible schools offer a chance to learn more about God and to grow in faith. It is also a great chance for youth to meet other area students. We believe that the faith development of our youth is enhanced through interaction with youth from other denominations. One of the VBS opportunities is with churches from Osceola-- St. Paul's Lutheran and the United Methodist Church. 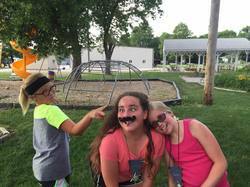 The other opportunity for our youth to attend VBS is in Benedict. VBS there is a joint venture between Benedict United Methodist Church and our partner in ministry-- Zion Lutheran Church. Each summer our Middle School and High School youth are invited to attend a mission trip. We often partner with area churches for the trip. In 2017 we went to Denver, CO where we were part of a Youthworks group that volunteered with Denver Metro Ministries and other organizations. We have built a partnership with Denver Metro Ministries since then and plan to return in the summer of 2019. Our 2018 trip was to Wanblee, SD on the Pine Ridge Indian Reservation.